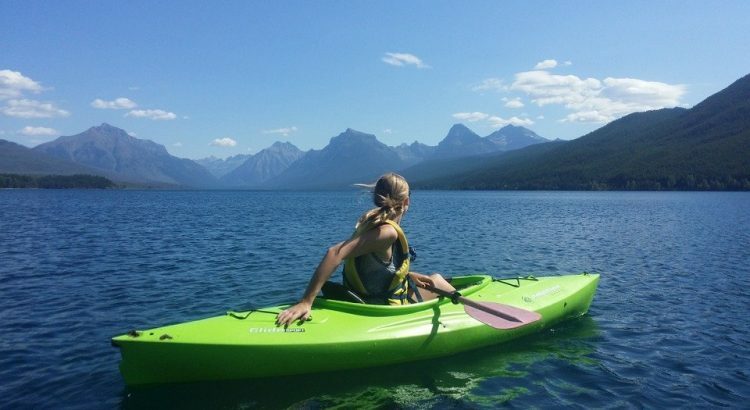 There are many types of kayak models on the market, and there are just as many destinations for the sport. So in order for you determine which is the best kayak and most appropriate for you when purchasing, you must identify your requirements. The best beginner kayak is the Sun Dolphin Aruba 10 as it offers great value for money in terms of a sit-in recreational kayak for beginners to gain good balance. Whether you want to race in a kayak, tackle rapids or take a tour of the wilderness, there are many considerations that you must differentiate between in order to determine which kayak is best for you. Kayaks are very particular in their use and are designed in several different types of configurations. For example, whitewater kayaks are designed for use within rapidly moving waters, whereas touring and recreation kayaks are for lakes, bays and other slow-moving, flat bodies of water. Sea kayaks are used for paddling in the open ocean. Kayaks for beginners to get used to can come in all sizes and shapes but the more desirable models being ones that you sit in. Below is a list of the best beginner kayaks that will give a novice user the best chance of a dry kayaking session. The Aruba by Sun Dolphin is an affordable kayak that is of the “Sit In” style. The Sit In style provides many advantages such as the ability to use your body to manoeuvre the kayak easier as well as more room for dry storage. Made from a highly durable UV-stabilized polyethylene, the hull is lightweight but strong at the same time. The seating position is adjustable with a high back support for the taller users, along with foot braces near the bottom of the hull. Both ends of the kayak have carrying handles which makes moving the boat in the water or transporting it out of the water much easier. The dimensions of the kayak are 30 inches in width, 13 inches in height and 120 inches in length. The max capacity of the user is rated at 290 pounds. The weight of the kayak is just 40 pounds, which means that it is easily portable by a single person looking to put it on to their vehicle or back into the water. Overall, it is the best beginner kayak with focus on good balance and reliable tracking. The Ocean Kayak Frenzy is one of the nicest looking kayaks in this article with a bright orange/red design. It is a Sit-On Style kayak that is best suited for fishermen and scuba divers. A common drawback with most Sit-On kayaks is comfort but not with this one. To increase the comfort, the Frenzy has a padded comfort seat cushion that can be adjusted in 4 ways to fit any body type. As a Sit On style kayak will be submerged in water quite often, the stern tank has 4 removable bungees to remove any excess water as as well as a bow deck bungee. It is one of the best sit on kayaks you can buy on the market today. When using this personally I felt that it was very stable and tracked perfectly when paddling away. The dimensions of the Frenzy are width 9 inches, length 31 inches and a height of 13 inches. The maximum weight limit for this Sit-On style kayak is 335 pounds, which is fairly high in terms of kayaks. The kayak itself only weights 43 pounds which means it is easily portable. The color and design of the Frenzy kayak is spot on in my opinion. You will be easily noticed in the sea and if worst comes to worst and you fell off, it would be easy to find it in the sea. The Intex Challenger K1 is one of the most popular inflatable kayaks on the market today. This is for good reason too because it has been designed to provide great comfort through optimum space and inflatable beamed floors to add stability. This is one of the best cheap inflatable kayaks that is great for beginners getting into kayaking. It is a 1 person kayak that is a low profile design to reduce the possibility of capsizing from a strong side wind. The dimensions of the kayak are 30 inches in width, 15 inches in height and 108 inches in length. The inflatable kayak weighs just 22.7 pounds and is capable of carrying users of 220 pounds in gross weight. The additional weight of the Intex Challenger K1 is slightly wider than other kayaks but this means it is easy to enter and exit. Another great feature that is highly intuitive is the net at the front which is great for holding drinks or food (I wouldn’t put electronics in there personally). By far the best two person inflatable kayak on the market is the Sea Eagle SE370k, which is extremely popular across the US. With a weight limit of 650 pounds, you are probably able to carry small children on your lap as you travel. The dimensions of the SE370K are 34 inches in length, 12 inches in width and 16 inches in height. It weighs just 32 pounds so both you and your passenger will be able to carry it fairly easily. If you are worried about inflating such a large inflatable kayak, don’t worry. This kayak can inflate within 8 minutes, which is quite impressive for a large inflatable kayak. Ignore what you have heard about inflatable kayaks being a waste of time. The latest are tried and tested in tough conditions and they are very solid kayaks that provide great stability for beginners. The material used is Sun and Saltwater Resistant and can withstand many knocks and scrapes you may occur. This inflatable kayak provides great value for money and high quality all in one package. If you have experienced kayaking and looking for the best inflatable kayak on the market, the AE1007-R is the answer. It has a hefty price tag but this is reflected in the high quality materials used and the sleek design. The bow and stern of the Advanced Elements AE1007-R is made from aluminium ribs that significantly improves the tracking through the water. The seating arrangement is adequate for two people with plenty of room but you can also adjust it to a single person kayak. There are three seating position that you can change to fit your personal requirement. In terms of comfort, both seats are padded all round with plenty of leg room for even the tallest of passengers. The dimensions of the Advanced Elements AE1007-R are a length of 32 inches, width of 15 inches and height of 15 inches. The one slight drawback is that it weighs 52 pounds, which is on the heavy side of thing when carrying the kayak long distances. The AE1007-R is expensive but it is very popular, which should give you confidence within buying this inflatable kayak. Some other features worth mentioning are advanced spring and pressure relief valves, rubber handles, skeg tracking fin, 6 chambers, deck lacing and many more. This inflatable kayak is the real deal and is for those looking to upgrade their current kayak to the best inflatable kayak you can buy. Lifetime Youth have developed the most popular and best kayak for children on the market today. It has been designed specifically for kids that are aged from 5 on wards and limited to up to 130 pounds in gross weight. The 6 foot wide kayak gives it the best stability on the water to ensure your children are as safe as they can be on a kayak. The sloped rear of the kayak gives the kids the best chance to swim/climb back onto the kayak from the water. This kids recreational kayak provides additional features such as the sloped rear, multiple footrests, molded finger handles, self-bailing scupper holes and more. Of course as this kayak is designed for children, it needs to be lightweight. Weighing at just 18 pounds, you as the parent or the child will find this kayak easy to carry around. The dimensions of this recreational kayak is 9 x 24 x 72 inches, which is almost half the length of an average kayak. As opposed to the hard shelled kayaks that have been around for centuries, the latest trend is inflatable kayaks. To those “old school” kayaking pros, they may turn their noses down at them but inflatable kayaks are perfect for beginners. Easy to Transport and Storage – They can be deflated and kept in a storage bag to keep in a cupboard for the next season. This also makes for great transportation to lakes all around the country. Inexpensive – Surprisingly cheap compared to the hard shelled alternatives. Lightweight – For those on their own, you can easily pull an inflatable kayak from the water yourself. Durable Design – Ignore the critics, they are very durable and use similar materials to inflatable rib boats used by lifeboats! Easier To Use – No matter your kayaking skill, they can be used by all. The inflatable kayak provides additional stability on the water compared with hard shelled alternatives. Possible Puncture – Very rare that it could happen but there is a possibility, particularly with cheaper brands. As you can see, the positives outweigh the negatives and the term “buy cheap, buy twice” is very valid when buying an inflatable kayak. Whether you buy a inflatable kayak or hard shelled kayak, the styles and specification are the same. It is purely down to personal preference between the two structures of kayaks and the buying guide will build your knowledge with kayaking basics. Recreational kayaks are those that can be use all around and are designed for trips in mild active water that can be used for casual bay, small lakes and pond recreation. Recreational kayaks are generally wider and shorter, which aids easier entering and exiting. This also makes them easier to operate and turn even though it is more difficult to keep them operating in a straight line. Recreational kayaks are a combination of tracking and turning mechanisms contained in a smaller hull makes them ideal for beginners and those who are looking for low intensity paddles. These floating boats are more than idea for ponds, lakes, gentle rivers, as well as creeks, but are not suitable for Whitewater rafting. Most people who are fishing, hunting or engaging in environmental photography find that these kayaks are perfect for their use. Recreational kayaks are ideal for beginners to intermediate levels of kayaking abilities. Touring kayaks are used mostly for trips of extended time, as they entail suitable amount of gear. These kayaks are long and sufficiently stable, having a great carrying capacity. But because they are well at tracking, they’re not as easy to turn as for the boats. These are often referred to as sea kayaks, although they are not restricted to use in the ocean. There are some models that are specifically designed for touring for the day, but they offer the least amount of storage space which is exchanged for a more controlled when the ability and lighter weight. Touring kayaks are equipped with a well-defined keel that allows for efficient tracking, are equipped with their initial stable and efficient secondary stability – in which case turning the bow is enhanced by edging. The interior of the cockpit of these boats are generally larger to allow for more comfort went on longer expeditions. Most come equipped with bulkheads and side access hatches, that increase the safety of dry storage. These boats are highly efficient for use in moderate waters such as lakes and flat water and wide rivers. Many of them have been fitted with rudders however the premium models often contain outriggers and sale provisions. Due to the more advanced level of skill required for Touring Kayaks, its recommended that you have an intermediate or advanced level of kayaking skill. Whitewater kayaks are capable of exceptional durability in order to navigate rapids in the water. In terms of size, they are shorter with rounded bottoms and flat planing hulls, with more rocker to better handle the waves. These are not as fun to use for touring because of the difficulty with paddling in a straight line. These type of kayaks have no keel equipment and are not able to track in a straight line, which increases their maneuverability and agile operation. The cockpit space is tightly designed to keep you inside of the boat, even when writing on rough conditions. These kayaks are specialized probes that are designed to allow you to quickly travel down the water, and are mostly used for racing. In terms of size, down kayaks are very narrow and long, making them easily tipped over and not very well compatible for amateur paddlers. There are capable of tracking efficiently because of the straight keel, but they can be unstable when turning. These kayaks are specifically designed to be used in the open ocean. They site very low in the water in order to reduce the effects of Crosswinds, and are long in measurement (often measuring longer than 15 feet). In most cases, the cockpit openings are small, the access to the hatches being small letters as well as containing bulkheads. In terms of the style of the kayak, there are two main styles. They are Sit On Top and Sit in, which both have their pro’s and con’s and are suited to different activities. As you can probably tell by the name, Sit On Top Kayaks are ones where you sit on a molded (often fiberglass) seats inside the kayak. They provide a very stable platform when fishing, surfing and scuba diving. For those who have concerns in terms of mobility and flexibility, these sit on top style kayaks are preferred over the type that requires you to sit inside the boat. However, you can still purchase an aftermarket kayak seat to help improve mobility. Just about all of the sit on top style kayaks have self bailing capabilities, which eliminates the worry about swamping the boats. On the other hand, these styles of kayaks are required to be wider in order for them to be able to compensate for the high center of gravity for the paddler. They are also slower in speed because of their width, even though they are longer to accommodates the distribution of the weight. Without thigh straps, paddlers are not able to effectively use their body in order to control the operation of the boat, and these types of kayaks also tend to be more cumbersome in terms of handling whether you are in or outside of the water. Sit in style kayaks are built with a more efficient design of the hull and tend to be drier than the other style of boats. They are designed to permit greater gear storage, equipped with a properly fitted cockpit that will allow you as a user to effectively use your body in order to control the maneuvering of the boats. With these style kayaks, it is important to have a scoop, pump or sponge in order to bail the boats. The walls of the kayak, referred to as bulkheads, form protective barriers that limit the infiltration of water. The properly fitted hatch cover equipped on the kayak delivers a sufficient margin of safety and flotation while ensuring for dry storage. The Sit In Style Kayak is often preferred as your lower body is covered from the wind and water spray. This makes kayaking much warmer and dryer, which is a massive positive. They are very stable and easy to use with many having large cockpits so you don’t feel to claustrophobic. The length of the kayak will determine how easy it is to paddle and how capable the kayak is for carrying loads. Longer kayaks are normally easier to paddle, offer more stability, are equipped to carry heavier loads while still performing well. They are also more efficient at tracking, are capable of moving at a faster pace, and tend to glide further along the water with each stroke of the kayak paddle compared to shorter boats. On the other hand, kayaks of shorter length are lighter, less expensive depending on the type of materials it is constructed from and are much easier for you to transport on dry land. The advantage of selecting a shorter kayak is the ability to make quick returns. The shortened hull is often preferred for those who are paddling down a narrow stream, as well as those individuals who are traveling with children or those of smaller size. Wider boats have much more stability in terms of being used on the water. The sacrifice for the extra width is the control and handling. The width provides additional capacity for the boat to be capable of carrying personal items, but kayaks that are very wide are more difficult to paddle and require more effort since the hull is working against more water. Narrow kayaks are not recommended for use in waters that have strong currents. When it comes to the turning and the tracking of the kayak, there is usually a trade off involved. In most cases, a kayak that is well at tracking, meaning that it goes straight efficiently will not be as good at turning. While some bows can be designed so that even though that they track well, they also can turn with the control. However these often require extra skill and will cost more to buy. The stability of the kayak is an especially important consideration when selecting any type of boat, as it has a direct correlation with the the amount of safety you desire. There are 2 different ways to define stability. Initial stability, commonly referred to as primary stability, involved your sensation as a user of the level of movement that is experienced when the boat is standstill. This also will determines how wobbly the kayak is when you enter or exit the boat. This is a big issue if your primary use of kayak is when you are watching birds, sunbathing or fishing in slow motion. Final stability, which is also known as secondary stability, is concerning your sensation of the boats movements when the boat is underway in motion. In most cases, a kayak that has a high rating of initial stability will fail to be as stable when operated over rigorous waters when compared to a kayak that has a low initial stability rating. Keep in mind as you get better at paddling, your comfort level with the stability of the boat will get better, so this will be influenced by how often you use the kayak and engage in paddling to become acclimated with the boat. The biggest difference that you will most easily see when differentiating between a beginner or advanced kayak is the initial stability. Advanced kayaks are most likely to offer less initial stability where as beginner kayaks would offer the maximum amount. Those who are experienced with paddling on kayaks often wants their boat to have the advantage of high final stability because it is much more beneficial and useful in the overall user experience of the boat, especially when enduring to rough water conditions. Kayaks are constructed of fiberglass, kevlar, plastic, wood, carbon, inflatable plastic as well as fabric with a frame. The heaviest of all materials is plastic, but they are the most resistant to damage. The most common plastic use is Polyethylene, which is a recyclable material and can be further recycled when the kayak is discarded. While it is essentially a plastic material, welding is required in order to be repaired in the instance that there is a leak. Fiberglass material is more durable than plastic and more lightweight, weighing only two thirds of the weight of Polyethylene but it costs three times more. Fiberglass materials cannot be recycled. Materials of exotic nature such as Kevlar or carbon are lighter then plastic and fiberglass, but strikingly more expensive. Boats made from wood are a rarity because of the sophisticated and intricate techniques that are required to construct them, but they are attractive and are highly sought after which is why there are a few manufacturers that produce wood kits kayaks. Kayaks that are made from fabric placed over a wood or metal frame are the lightest boats, but they tend to be expensive. The classic version of of the fabric over a wooded frame can be bought as a kit that requires quite a few hours of assembly. The benefit of choosing a boat with a foldable metal frame is that it can be collapsed into a compact variable back when the kayak is being used for hiking expeditions. By far, these are the most expensive kayaks on the market when compared to other options. Another option would be an inflatable kayak, which allows for a more portablility. These kayaks are ideal for enduring rough waters, so white water or surfing expenditures can benefit from its use. Compared to a hardshell kayak, these boats are not as good as tracking, but as a range from inexpensive to expensive prices, the increase in terms of performance and quality, unlike hardshell kayaks. It is your feet that makes contact with the boat when you stand, hips and bottom when you sit on the seat, and knees when on the underside of the that. So you should consider all of these points of your body, ensuring that the boat provide supports and comfort in all aspects. If you are a person with large feet, you will want to ensure that they comfortably fits under the deck and on top of the foot brace. When engaged in paddling, you will be required to brace your feet and knees in order to maintain stability and to execute terms. When kayaking in a white water boat, you will notice that there is padding provided in order to ensure you are tightly fitted into the cockpit, which will prevent you from falling out of the boat when conducting a roll. But if you are planning on going on a long excursion, or you need room to stretch and move about when inside the kayak, then you may require a looser cockpit fit. The opening size of the cockpit is especially important when considering how you will be getting in and out of the area. The newest models of Whitewater kayaks are designed with a large keyhole cockpit that offers a snug fits. While this design is intended to hold the paddler snug in the cockpit, it has the spacious capacity to allow for entry and exit of the cockpit easily. Old school, traditional kayaks feature smaller cockpits, sometimes as small as the waste of the adults paddler. Having the small size cockpit merely eliminates the possibility of the boat caving to a large way in the skirt and causing the boats is want. Recreational kayaks are designed with the largest cockpits to allow for the maximum amount of space, but they offer no protection when the boat turns over. If you prefer to have two people paddling at the same time, then a double kayak is perfect for you. Similar to a canoe, you can travel just about any type of waters. Kayaks with single capacity are much easier to maneuver then those with double capacities, but double capacities are capable of carrying more gear. Many experienced riders enjoy using a rudder in order to steer the direction, but that can also be accomplished easily when using your paddle. If you insist on using a rudder, ensure that the design that you choose has durability, can easily be stowed when not in use and has a brace design that is simple for you to use. A retractable skeg can be used as an alternative to a rudder, you train the boat so that it is more controllable when the wind and sea conditions are changing. On the downside, it will not give you the same steering power that a rudder will. With Sun Dolphin Aruba 10 Recreational Kayak. Very lightweight, I can lift it up to the top of my SUV by myself. I’m a beginner at kayaking and I have no trouble paddling it around my local lake, it is easy to put in and out of the water and quite stable getting in and out of it.